Targeted LinkedIn ads are a great way to increase the exposure of your brand, get new sales leads and generate new business with a local company. Apart from Facebook, LinkedIn is probably the only other social network that offers a great return on investment for B2B advertising. LinkedIn offers one of the best lead generation opportunities in the world of social media. They have even said themselves: “LinkedIn is the #1 Social Media Network For Lead Generation”. It is great because you can download phone numbers from LinkedIn, you can post native video to build an audience and you can even begin social selling. 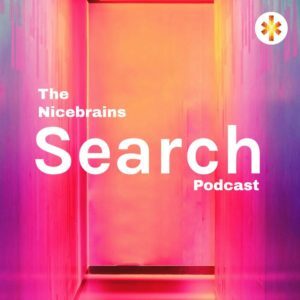 You can target just about any company you want to and can be as specific as you want to. When you advertise on LinkedIn, you also have the option to connect with anyone who interacts with your ads, this includes anyone who likes, shares or comments on your post. 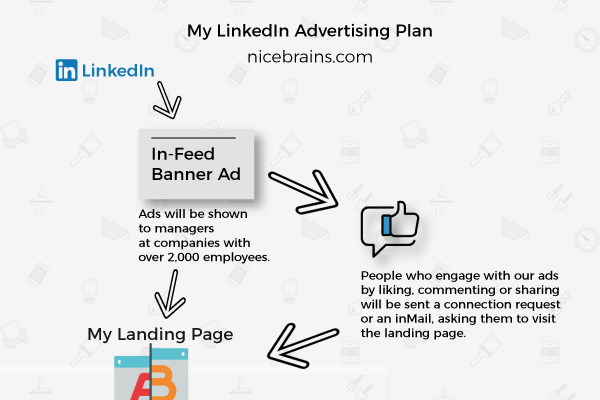 Before you create advertising campaigns, read through our LinkedIn best practices. Have a look at the targeted advertising plan I used on LinkedIn. With this plan, I was as specific as I wanted to be without spending money on the clicks that did not matter. Create In-Feed Banners For LinkedIn (I created a few variations to test). I connected with anyone who likes, comments or shares on my ads. Anyone who clicks on the ads will be directed to my landing page. I then had a phase 2 plan which involved using Google display ads to take advantage of Google’s network of over 2 million websites. After implementing my ads on LinkedIn and getting people to click and visit my website, I planned to remarket to the visitors if they did not make an enquiry or buy something! To do this, I created a remarketing list in my Adwords account and only included the people who visited my specific landing pages. 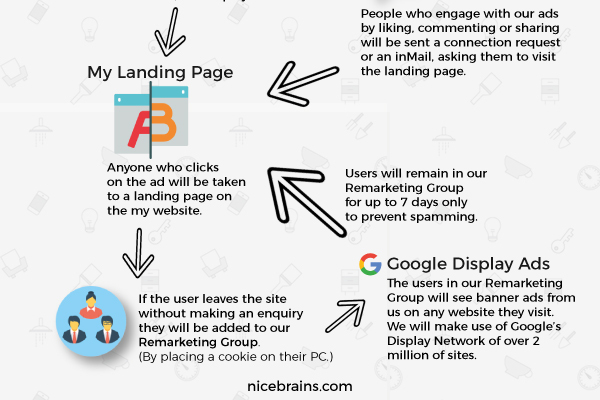 Add anyone who does not make an enquiry or buy something to an Adwords remarketing group. Have them visit a variation of the previous landing page with an offer to entice them. Keep them in the remarketing group for 7 days to avoid spamming. How Is LinkedIn Ads Different To Facebook Ads? The biggest difference between using LinkedIn Ads and Facebook Ads is the audience. With Facebook, you can target a broad category of users who are interested in many different things. Facebook can be used for B2C as well as B2B marketing to promote anything from food items, groceries or even market a clothing line using facebook clothing ads. LinkedIn on the other hand is quite limited to B2B marketing because of its professional audience. With that being said, with a creative campaign, you can market consumable products on LinkedIn too. Show your prospect how good your product is on LinkedIn. Let them see it on your website. Let them see it on another website if the are not convinced. You should also A/B test your landing pages to make sure that you are using the right CTA, copy and heading combinations that are most likely to convert. There you have it. 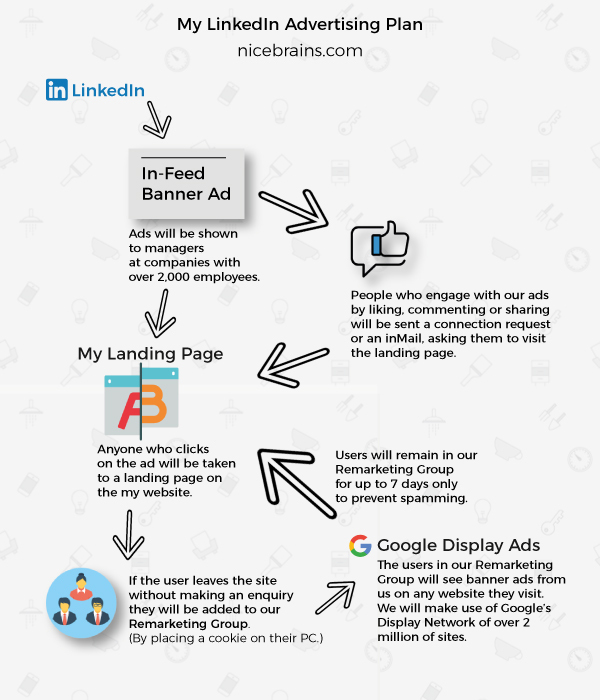 You can download the image above and show to your boss, it is a very clear and straightforward explanation of how targeted ads on LinkedIn should work. Check out our other LinkedIn guides here.